Tickets cost $55.00/person. The ticket price includes a multi-course dinner of regional Mexican dishes. 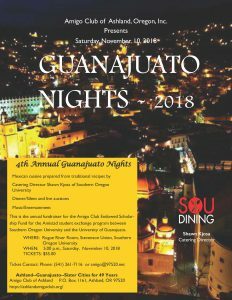 To purchase tickets, please contact Mina Turner at amigo@97520.net or call her at (541) 261-7116. Donations for the silent auction are still being accepted. If you have items to donate, please contact Mina Turner (contact information above). Remember that a gift to the Amigo Club, a 501(c)(3) tax-exempt organization, may qualify as a tax-deductible charitable contribution deduction. Silent auction items include Mexican art, textiles and jewelry; art by local artists, gift certificates, and professional services. Live auction items include Spanish language study in Guanajuato, several-day to week-long stays in vacation homes in the U.S. and in Mexico. Here is a list. Amenities include Beachfront location, A/C in Bedrooms, WiFi, Ocean Views, Daily Housekeeping, 4 Twin Size Beds, 6 Full Size Beds, 2 King Size Beds, Ceiling Fans, Hammock, Lounge Chairs, BBQ. MEXICO, GUANAJUATO: Luxury home remodeled in beautiful Mexican style, Offered by Amigo Club member Karen Gans. Amenities include 3 bedrooms, 2 ½ baths, garden retreat; 20-minute walk or quick bus ride to downtown Guanajuato; La Presa reservoir park just blocks away. Accommodates 3 couples or family of four. Dates for week-long stay will be arranged with Karen. MEXICO: HOTEL VILLA DE LA PLATA – GUANAJUATO. This Guanajuato hotel is a 15-minute walk of La Valenciana Church, Bocamina San Cayetano, and San Ramon Bocamina Museum. The town center is within 3 mi (5 km). Along with a restaurant, this hotel has an indoor pool and a fitness center. Free continental breakfast, WiFi in public areas, and self parking are provided. Other amenities include a bar/lounge, dry cleaning, and a 24-hour front desk. MONTEREY BAY, CALIFORNIA, 3-night stay. You will be guests of Josie Wilson and Michael Belsky who live three blocks from the beach in Pacific Grove, CA. They are near Pebble Beach (for golfers), Carmel-by-the-Sea (for those who like quaint art-infused towns), one block from 17 mile drive with spectacular ocean vistas, two miles from the Monterey Bay Aquarium, and near many wonderful restaurants and other activities such as biking and hiking trails. Josie and Michael will loan you 2 guest passes for the Aquarium, provide 3 breakfasts and 3 bagged lunches. Dates will be arranged with the hosts who will be present during your stay. MEXICO, GUANAJUATO: Week of spanish study at Escuela Mexicana, Offered by the owner Haydé López and her daughter Cybelle López, who is the Head of Student Affairs. http://www.escuelamexicana.com/contacto.html Certificates for 4 people (2 couples). Each couple will get a week of Spanish study (20 hours/person), plus an apartment in Casa Mexicana. A couple may “upgrade” to private home stay and/or individual lessons instead of small group classes.